Rabbits live in wetlands, deserts, grassland, forests and meadows across North America, Europe, Japan, South Africa and Sumatra; they are also sometimes found in Middle Eastern deserts in areas that are green enough to sustain life. 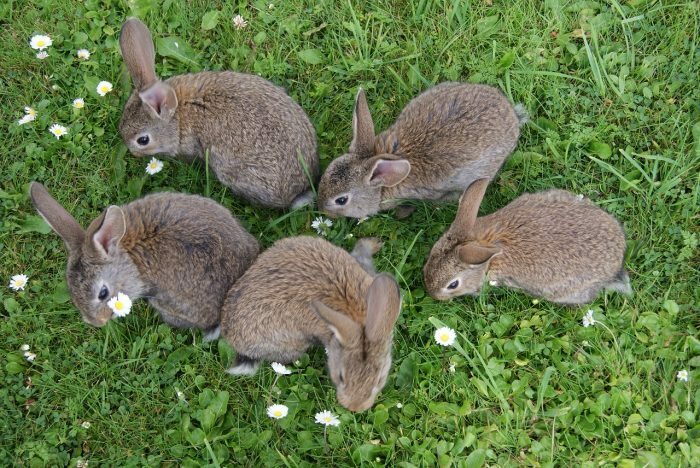 Rabbits live in groups, usually digging out burrows beneath the ground for shelter. Rabbits use burrows for food storage, hiding from predators and giving birth to and raising their young. Rabbits prefer habitats where their main foods are found, including grass, clover and crunchy vegetables. Because of their ability to destroy crops, they are seen as pests by farmers and gardeners. Dens and rabbit nests are usually found near field edges, landscaped areas, brush piles and along brushy fencerows.